Bundle of Element Tk, Mf, Kb & Bt panels. With today’s multi-purposing work stations, where desk space is at apremium, having a fully featured panel that is compact, fully featured and stylish enough to match its surroundings is a must. But, you’d expect that having a compact design means having to compromise ergonomics, features and control size. With the Element range, there is no compromise! 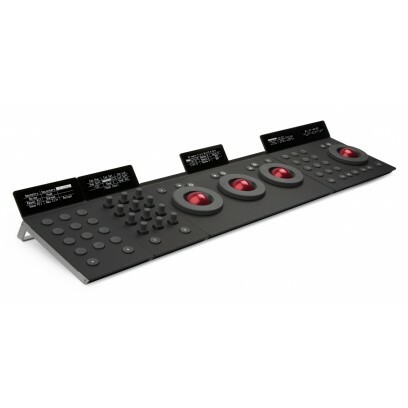 Despite their small desk foot print, each Element offers full size controls which are ergonomically laid out, and best of all, there’s lots of them! Apart from the size, the first thing you will notice about Element is the stylish, ultra slim design. Quality comes inthe form of a solid aluminium, precision laser cut case. But it doesn’t end there; all the internal components have been carefully chosen for reliability. All rotary controls and tracker balls have optical pickups, which means they are long-life and high precision. The buttons are ultra-reliable with a positive tactile response. The displays are crisp, high-contrast,high-resolution, easy to read, white OLEDs. When put side by side the panels magnetically lock together, keeping the layout neatly aligned. When it comes to having lots of controls, one of the problems can be “just what does each control do?” This isn’t the case with Element; every programmable control is clearly labelled, so if the function of the control changes, so does its display label – no more having to refer back to reference notes or on screen help. When Element panels are used with Tangent’s TUBE software, you can even customise the layout of the controls, making them even more intuitive to use.